Review: For my 31 Days to Scare, I woke up one day with the urge to track this film down. I can’t say why the movie came to me out of the blue or what moved it to the top of my list after it did but needless to say I would up later that day renting Dr. Giggles and giving it a whirl. It wouldn’t be right to say that the years haven’t been kind to this 1992 horror film because the film was never that good to begin with. This is probably the third or fourth time I’ve seen it and I’m certain that it will be my last viewing. 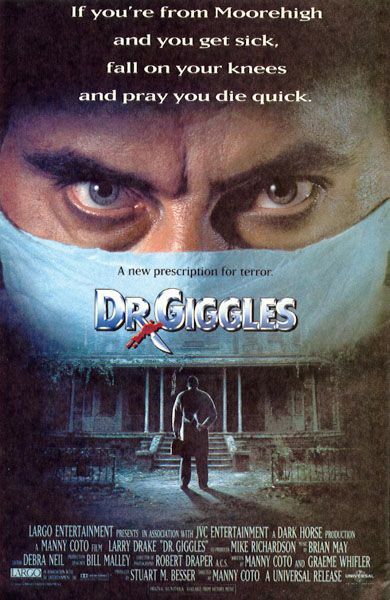 A pathetic attempt to blend horror and comedy, Dr. Giggles is all concept and no real execution…unless you count the death of several film careers because of it. A Nightmare on Elm Street started off as a dark horror film that with each passing sequel turned its central monster, Freddy Krueger, into a comedy act. As the series changed its tune/tone, the jokester bits of Krueger became something that audiences expected when they entered the theater. Krueger had a nice little send off for his victims…usually a terrible pun on his method of sending them to their maker. Dr. Giggles tries that same technique resulting in some hideous one-liners related to medical jargon that didn’t even work when it was originally released. Carrying around his medical bag that houses a Mary Poppins-esque treasure trove of oversized medical devices that reminded me of a Fisher Price toy box, Dr. Giggles (awkwardly shaped television actor Drake who was much more effective in Dark Night of the Scarecrow and Darkman) makes too many house calls over the course of the film and the result is a yucky mess of a film. It doesn’t help that our leading lady is a snoozer. Combs was not destined to become anything more than a television star and it shows here in a performance that’s laughably awful. You shouldn’t root for the villain in the film but you may find yourself hoping Giggles gets to her stat. The late Quinn (best known as Becky’s husband Mark on Roseanne) is decent as her semi-concerned boyfriend but any real character development is thrown out the window in favor of ghoulish kills that are more zany that gory. It’s a shame that it’s all so poor because at the heart of Dr. Giggles is a creepy little plot that could have worked better by removing the comedy, recasting the leads, and giving greater weight to the fear we all have of facing a needle. I usually am an advocate for people going to the doctor when they need care but this is one check-up I should have skipped.